A few days ago, the wife and I had an nice chilly walk in Hoyt Arboretum. Snow was in the forecast, and she wanted to go to one of the higher spots in the metro area to see it. The white stuff amounted to little more than sky dandruff, yet we enjoyed walking on the Wildwood, Hawthorn, and Maple trails. I enjoyed learning about a few more species of tree. Amur maples. Who knew? Plenty of people walk around the arboretum, yet it is always a serene and lovely spot. The horizontal reach of these branches on a species of cherry (?) was impressive. 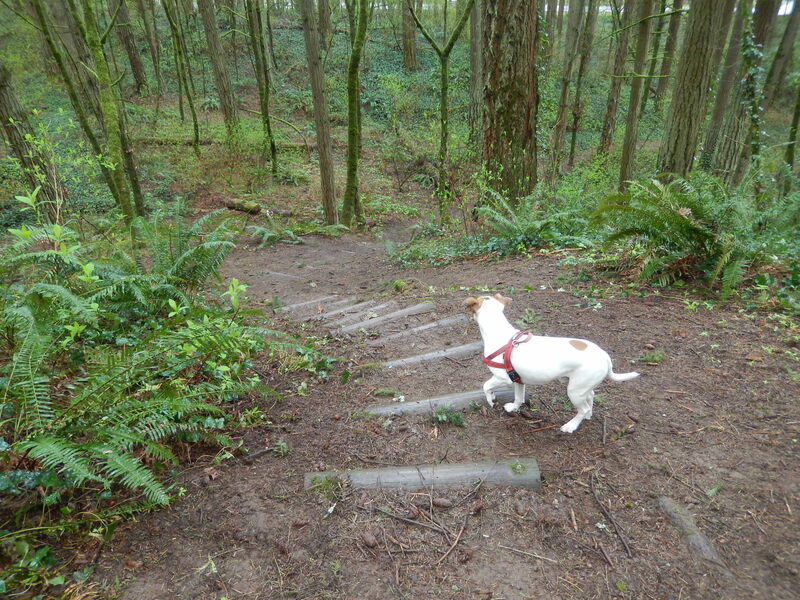 Amazingly, after decades in the Portland area, I can still find new parks and trails. Not that I’ve hiked everything, but at least I know about most of the trails in the metro area. Not so in the case of River View Natural Area, located on Highway 43 south of the Sellwood Bridge. It’s a small oasis of green nestled into the hillside above the highway and below upscale neighborhoods. I saw the park sign recently and wondered about it. So it was that I decided to take stroll there with Jackie Chan. Parking is on the skinny side beside the highway. The hillside looked relatively open, with no dense groundcover. There were numerous deciduous trees on the hillsides across which the rudimentary trails navigated. The trees showed off a touch of fall color. Interestingly, the majority of them close to the highway had vines stick to their trunks or draped from branches. I could also see where people had hacked at the vines to kill them, presumably in the hopes that the vines would not kill their host trees. The trail was bit muddy in spots, and there were few signs of other hiker or joggers. In fact, I saw nobody else as my pup and I completed a pleasant loop and returned to the car. And now I know about the River View Natural Area. This morning the wife and I took a casual stroll along the riverbank with our pup. 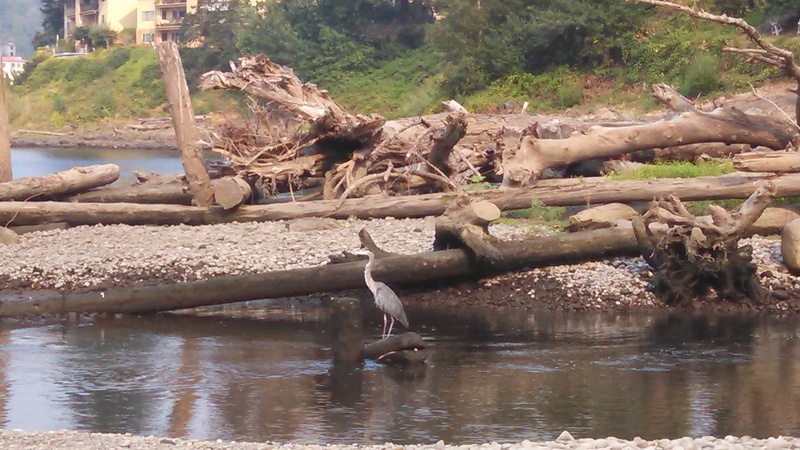 While I was gawking at an osprey way up in a tree, I didn’t see the Great Blue Heron standing in the mouth of the creek. We are lucky to have lots of both birds in our area. The heron, I learned, weighs less than ten pounds despite a massive frame. Apparently this is due to hollow bones, like all birds. And it if looks slow, don’t tell the fish. It strikes fast when it’s going for food. I was able to get fairly close before the bird spooked, doing a graceful flight out over the river, then a return swing up the creek drainage. Quite a treat for a Sunday morning stroll. Ho hum, another waterfall run. The Bridalveil exit off Highway 84 eastbound signals the beginning of the Columbia River Gorge. It offers immediate access to the old highway and a high density of mountain and waterfall hikes. Bridalveil Falls had escaped my attention until recently. 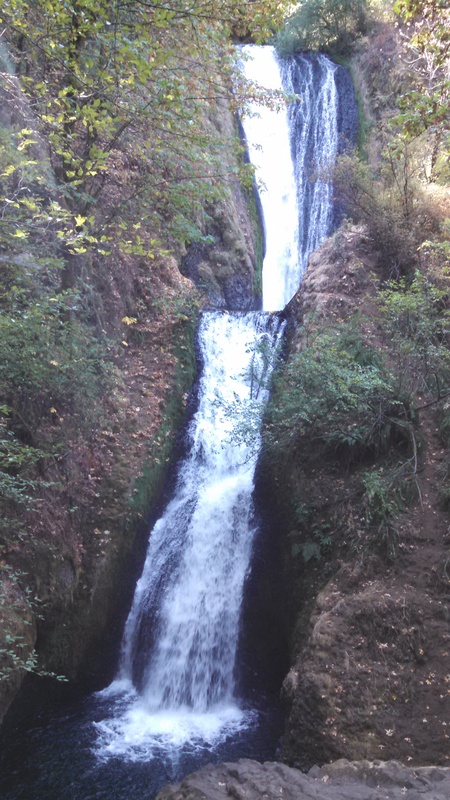 A short downhill hike takes one to a viewpoint of the falls pouring into a pretty little canyon and a babbling stream. For some reason, I only took a few similar photos. Oh well. Nice spot. 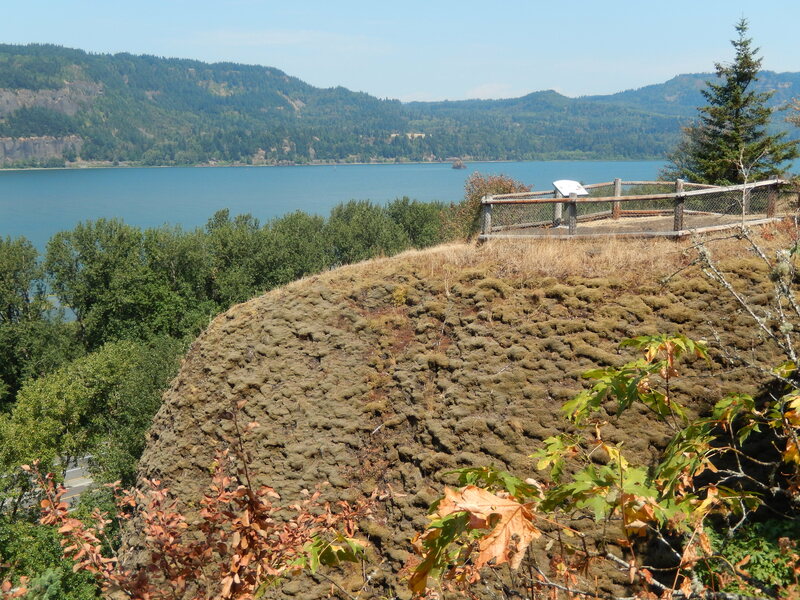 Back at the trailhead, a mostly paved path leads to bluffs overlooking the Columbia River. I realized I’d seen the railings on the these bluffs from the highway, but never knew how to access them. Now I know. For some reason, I took a lot more photos on this casual walk than when I saw the waterfall. 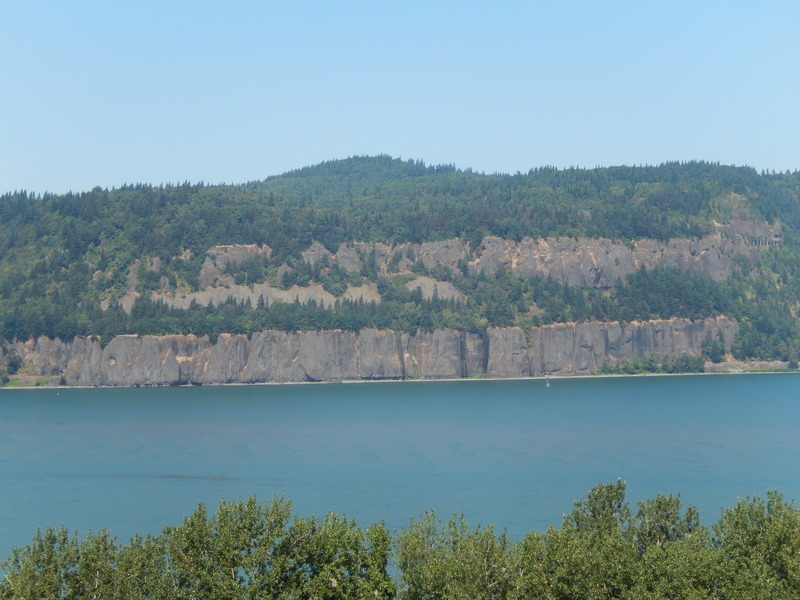 Across the river, there is a cool perspective on the volcanic layer cake of the Washington side. It’s funny to realize a railroad and highway are squeezed in there. Great views are in abundance, especially to the west, with Sand Island in the river and Crown Point looming in the background. Both of those spots I had seen recently from a different perspective on my Rooster Rock venture. This was a nice visual cross reference. The views are more open than most in the Gorge, and with little effort expended, so that was a treat. 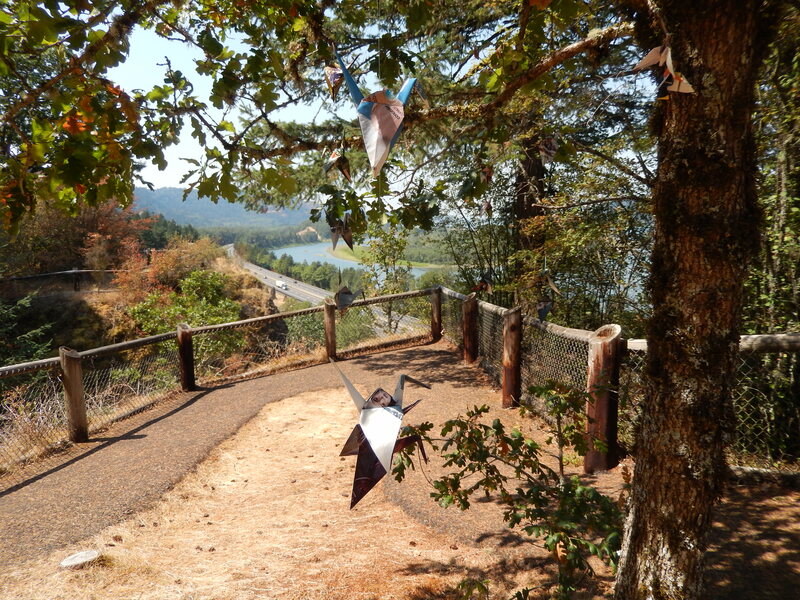 An origami mobile hanging from a tree at one viewpoint prompted curiosity. Who would have gone to such efforts and why? Both paths at Bridalveil offer great walks for those who don’t want to put forth a great deal of effort, yet still want some great views. 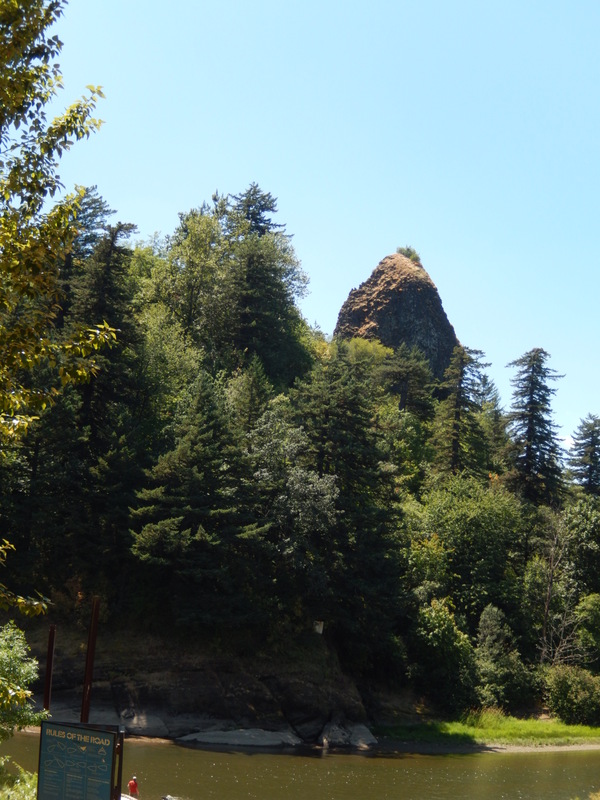 For an introduction to the west end of the Gorge, one could hardly do better. 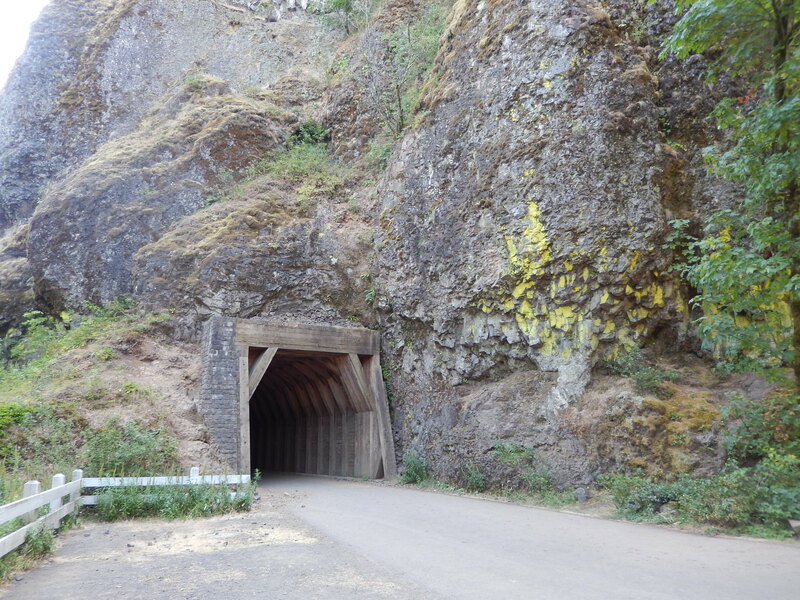 The Columbia Gorge highway used to go through this tunnel beside the entrance to Oneonta Gorge until the late 1940s. Oneonta Gorge is, well, gorgeous. 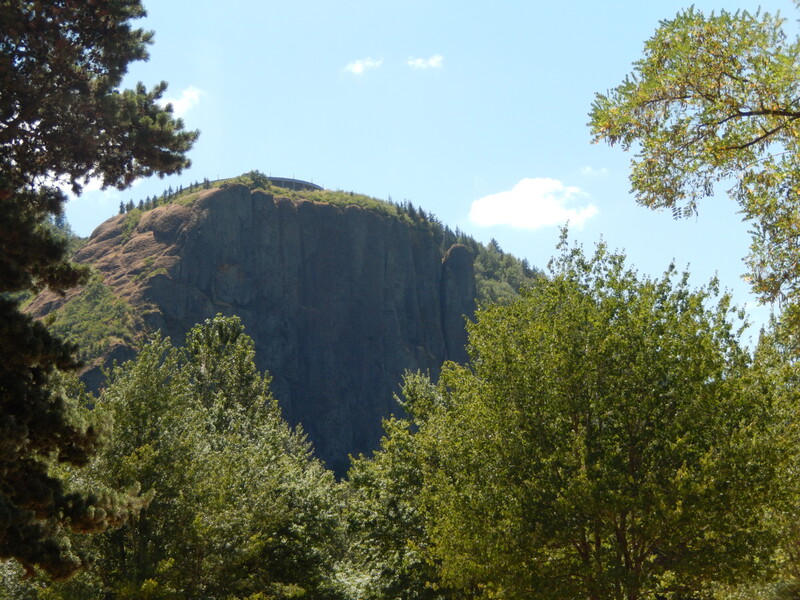 I’d never done the full hike, which is like the Columbia River Gorge’s entry to canyoneering. Hikers have to clamber over a massive log jam, then walk right in the creek to get to the destination of the waterfall. Denise and I had been there before a few years ago, but had never ventured too far, as the season was wrong to get wet. Today, with temps in the nineties, I was primed to try it. It’s been hot for a while in Northwest Oregon, and a lot of people seemed to have the same idea. I arrived at the trailhead by 10 a.m. and barely got a parking space. As my dear readers may know, I like my solitude, but was not worried. I figured once people realized they were going to have to scramble over a log jam and set soaked upstream, many would turn around. Boy, was I wrong! Oh well. Beyond the log jam, I was really in the bowels of the chasm. 1The walls were only 25 feet apart at a few points. There was no solitude on this hike, but plenty of adventure and beauty. Soon enough, I was getting quite wet, sloshing along up to the middle of my shins. Then it got interesting. I tried to skirt a deep pool by clambering on rocks, but to no avail. I had to get soaked up to my belly. The water was chilly at first, but not too bad. After traversing the narrow, deep pool, the canyon opens up a bit, then effectively dead ends in cliffs split by a good sized waterfall. People wandered around taking selfies and group portraits. A few waded in the deep pool below the falls. I gawked at the canyon walls as much as anything. What a lovely place. I could have stayed there a long time, but the crowd seemed to keep increasing, so I turned back, reveling in the beauty of Oneonta. There’s a good reason it’s popular. Jackie Chan, my faithful canine hiking pal, has been sick for some time, so a hike the other day was the first time he’d joined me on a real hike since his megaesophagus diagnosis. I opted for a casual hike to Sundial Beach near the mouth of the Sandy River which I’d found online. It’s directly across the river from the delta where I had walked multiple time before, but Sundial Beach has considerably fewer hikers. 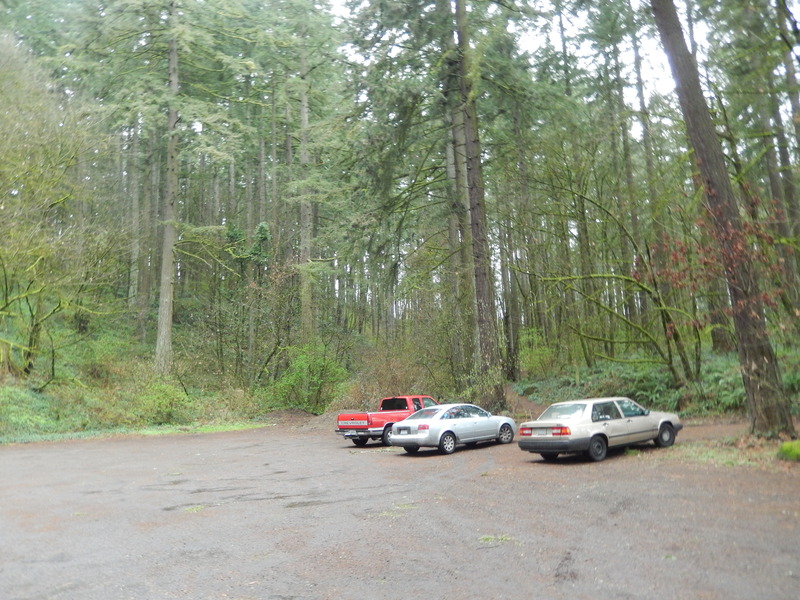 The trailhead is along Graham Road across from the Troutdale Airport. The paved path heads onto a long dike, apparently guarding the airport and nearby industrial concerns from flooding. 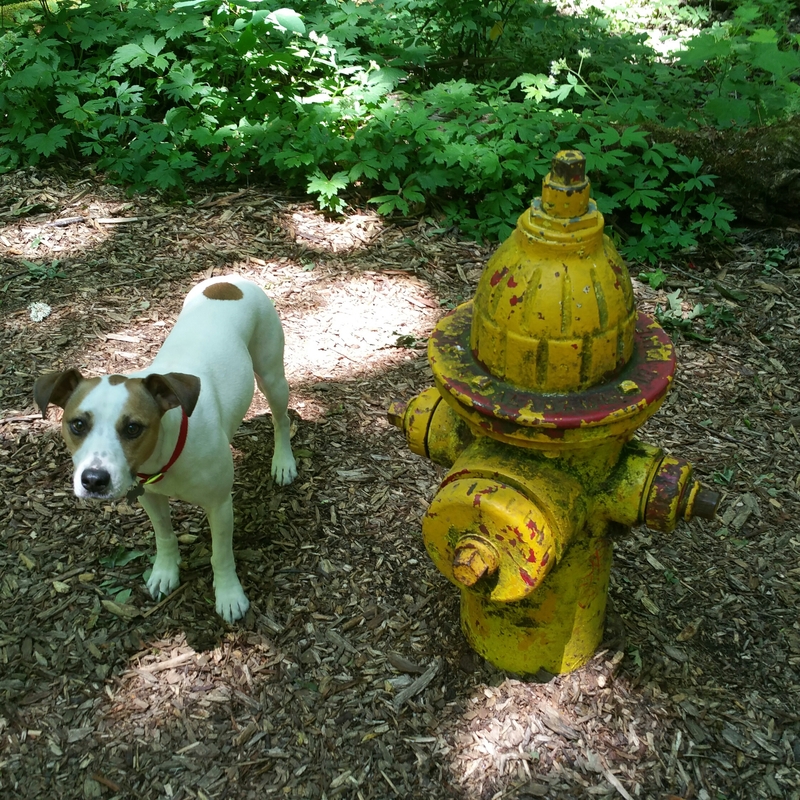 It is also one section of the Portland area’s 40 mile loop trail, a clear dividing line between the urban world and the natural world, a line on which I enjoy walking. Unsigned side trails drop off the dike and give access to the banks of the Sandy River. I followed a few in search of beauty, which I found, along with other walkers and swimmers. Plenty of dogs played in the water and on the sand. 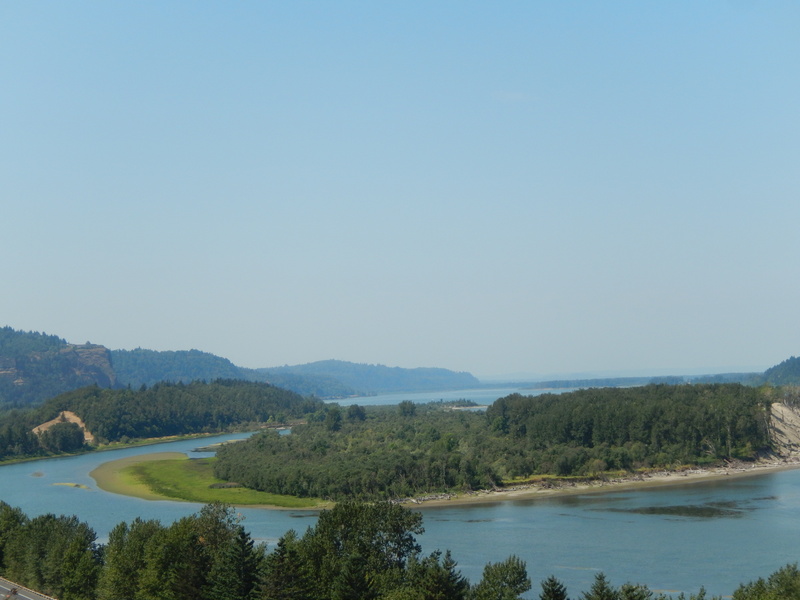 I continued on, seeking the Columbia River. The dike and parallel trails curve north and west, and high energy power lines dominate the scenery at points– both practical necessity and visual disappointment, like so many things in our world. For a while, the towers reminded me of the Tripods in the dystopian fantasy series The White Mountains (highly recommended for tweens). It was pretty hot for much walking, but Jackie and I made the best of it. Finally we reached the real beach on the Columbia, which seemed mammoth due to low water levels. This would be a great spot for a picnic. A kayaker came down the Sandy, wondering if he’d reached confluence. I suppose it was a bit hard to tell with many sandbars and such in the low water. On the return leg, I saw a raptor guarding its nest atop a “tripod”. I think it was an osprey but could not be sure. The paved path started feeling like an oven, and Jackie started slowing down, so I was glad to get back to my car with its air conditioning. Besides, the tripods could not follow us there. I am always looking for green swaths of undeveloped land near me, and I tire of going to the same old places repeatedly. 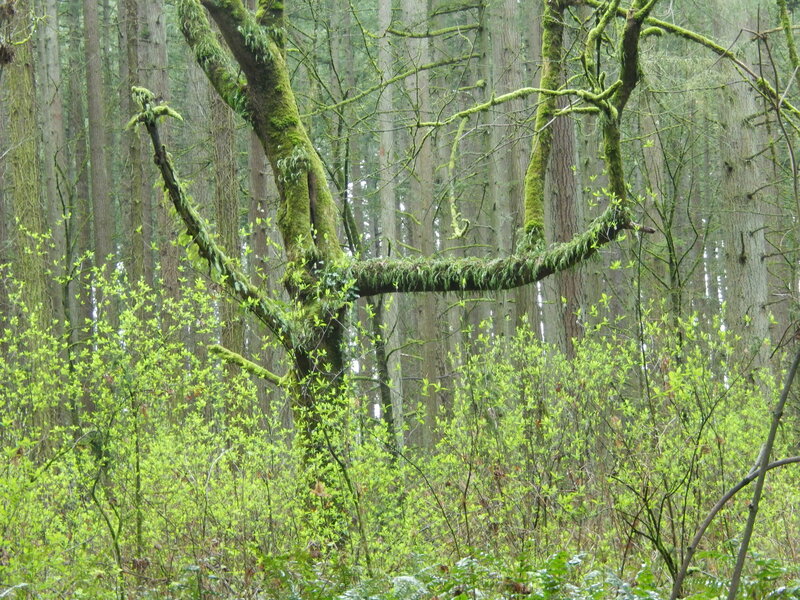 A photographer friend mentioned a nature park in West Linn, but I never caught the name. No problem. What I found was Wilderness Park, fifty-plus acres of pretty woods in the middle of upscale suburbia. The trail system seemed relatively simple. I could make a loop from various points. 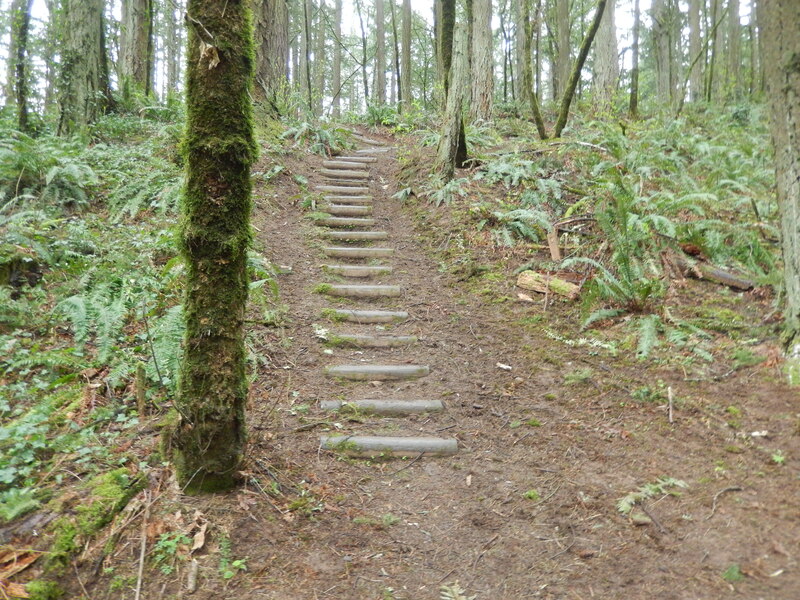 In short order, I found myself climbing a rather steep set of stairs with rounded log steps. They seemed unique on the way up, but I had a different adjective for them on a wet descent. Looking up the steps. Wait, I might have to huff and puff? Once on the loop, the trail is at an easy grade, and the walking is pleasant. It is a good place to escape from the noise of the world, even for brief visit. I found myself looking at the subtleties of the greenery a lot. Leaves fascinate me at times as the perfect examples of the cycle of life. The tree might not die for centuries, but the leaves come and go annually. They are so green with youth in the spring, colorful in their maturity, and then they fall, wither, decompose, and vanish. I find it beautiful to note the way they add different notes to a landscape depending on the light. 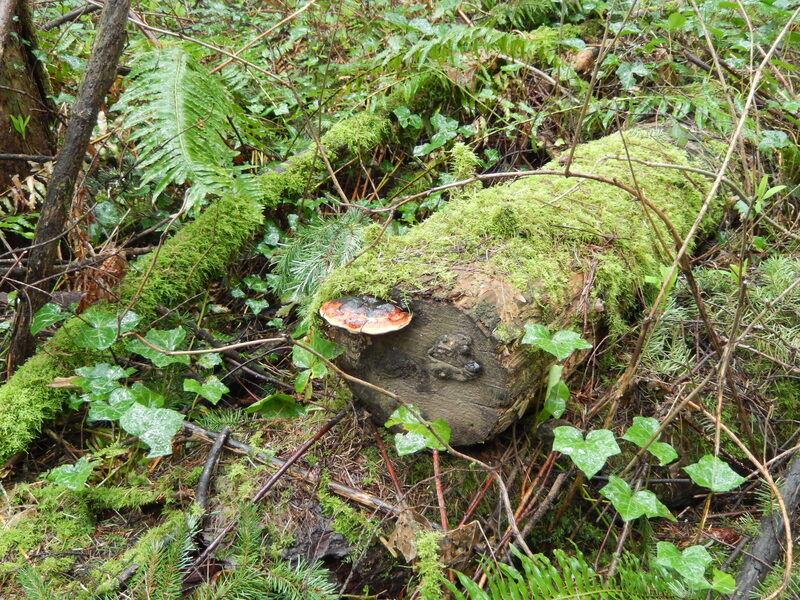 Even on a wet gray day, Wilderness Park was great place to hike locally. I also found a second nature park on the way home, which I believe is the one to which my friend referred, but that’s for another post. Happy trails.